If left the Vox Media venue and was in search of the rest of SXSW; finding and documenting what’s new for 2019. I was heading east on West 6th Street when I turned around to snap a picture of the ubiquitous electric scooters that have fully infested the event. A guy on a Jump scooter which I talked about yesterday. Sometimes a snapshot turns out a lot better than expected. 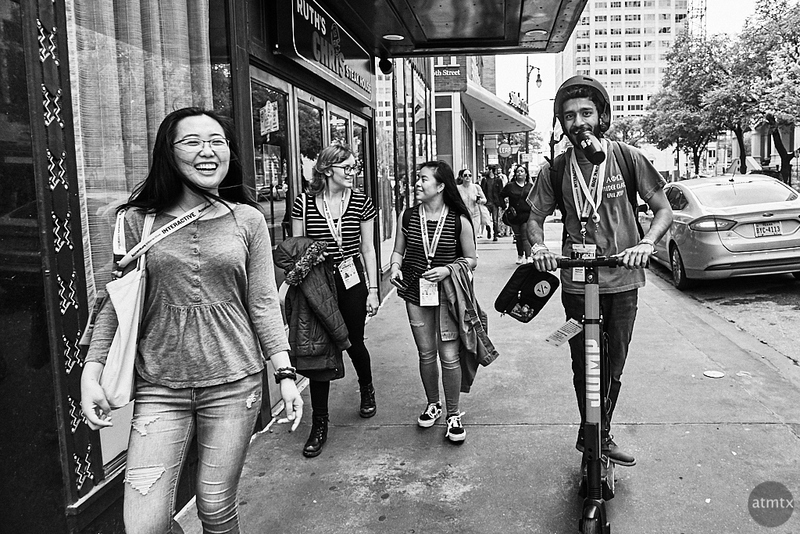 Two smiling people and two others, all with SXSW badges. A light-hearted scene from the street in Austin. Some visitors can be pretty serious, moving purposely between venues. They also hail from more serious places like NYC and LA. It’s nice that I got this reaction to a stranger with a point and shoot. I often wonder and talk about the choice of camera on the street. Would I have gotten the same reaction with a big DSLR or even a serious mirrorless with an imposing lens? Did using a small non-threatening compact camera (Canon G7X Mark II) change the dynamic? Hard to know of course, but I think so. I have a free monthly newsletter that’s perfect for busy people. Signup for the Newsletter to get the best of my posts, old and new, plus additional content not available anywhere else.